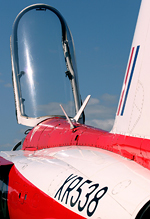 Much attention has been lavished upon the Red Arrows in 2014 as the RAF Aerobatic Team marked their 50th display season with, amongst other events and celebrations, a special tail design that proudly displayed the slight form of the Folland Gnat in a nod to the team's rich heritage. 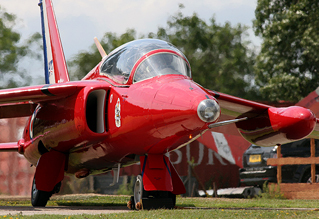 As the only operation currently offering the Red Arrows original mount for display, 2014 has also been momentous for the North Weald-based Gnat Display Team as they took on a key role as part of the Reds 50th, participating in multiple flypasts and displays across the spring and summer months. 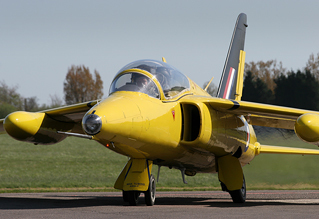 Welcoming a third Gnat T1 to the display, in the livery of the Yellowjacks, has also kept the team busy and with plans for future growth, it is an important period for the team. Scott Perry discussed the team's 2014 season and future progression with Kev Whyman for UK Airshow Review. Photography as credited. Since their inception in 2008 the Gnat Display Team has steadily built up - in both aircraft numbers and stature - to become one of the most favoured classic jet acts on the display circuit. Kev tells us about the team's origin: "The team was 'formed' with the acquisition of the second jet (G-TIMM) in 2008, until then myself [Kev] and two other aviation enthusiasts were equal part owners of a single jet (G-RORI), since 2005. The second jet enabled pairs formation flying and display routines. We practiced these at length in 2008 and formally 'hit' the display circuit and presented ourselves to airshow organisers in 2009, which was our first full season as a pairs display". 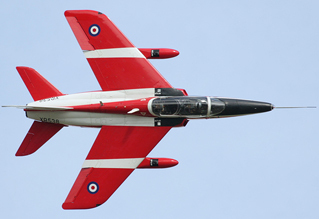 The Folland Gnat is of course no stranger to the air display world - as well as its history with the Red Arrows, several other organisations have operated the type in the UK since the Reds swapped theirs for the BAe Hawk. The diminutive stature of the Gnat can make it quite challenging to fly and operate, but it's a platform well suited to the airshow environment: "There was a saying in the 60s that you didn't so much get into a Gnat as put one on, the jet is one of the smallest out there! It is a joy to fly, its swept wing and small size makes it inherently unstable and therefore super manoeuvrable. I flew the Hawk in the RAF and would take the Gnat over and above that any day. The downside is that the practical maintenance is more onerous, the old 60s technology, lack of spare parts, static line refuelling etc. make it more resource intensive to turn around." A striking new addition to the team for 2014 was the former Delta Jets T1, G-MOUR. Retaining the bright yellow paint of the Yellowjacks display team that it wore in Delta's hands, the team have slightly revised the markings, repainting the tail in contrasting black and re-designating it as XR992 - fictitious markings for this particular airframe, but changes that give it the appearance of Flight Lieutenant Lee Jones' lead aircraft from the Yellowjacks team in 1964. With the Red Arrows anniversary celebrations, it may seem that G-MOUR's re-emergence after overhaul was perfectly timed for its debut season with the team, although Kev tells us it was more of a happy coincidence. "In an ideal world we would have had G-MOUR airborne last season, but restoration projects always take longer than expected". The airshow-going public have enjoyed the expanded displays and the reaction from the air show organizers has also been encouraging for the team: "Very positive indeed, and initial feedback has referenced the three-ship as being at least twice as good!! The one problem with the Gnat is its small size, so having more of them in the sky in close formation helps compensate." The extra jet in the display not only makes a difference to the routine that we see, but has also meant that the team has needed to put in extra work into their preparations to take advantage of the extra potential the three-ship offers. "A huge amount [of extra preparatory work was needed] - an extra jet in the sky in close proximity requires a lot more work and co-ordination. It also opens up a host of new combinations for the formation flying, pair vs singleton flying etc." As expected, the significance of the Red Arrows' anniversary had a knock-on effect and meant the Gnat Team enjoyed great interest this year. Numerous invitations to take part in events and flypasts were received, but it takes months of planning to turn them into reality. "We have done two flypasts with them [The Red Arrows], one at the RAF Waddington airshow and one at RIAT. We have had a close relationship with them for many years so it has been fantastic this year to finally fly with them. 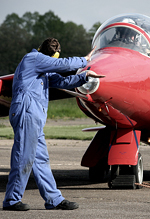 We have also done a number of events for the Red Arrows alumni, including ex-Reds pilots, specifically from the Gnat era. One moment from the alumni events that the team are particularly proud of was reuniting Henry Prince, the original Red7, with the Gnat. Henry was given the opportunity to fly with the team on their transit to RIAT, perhaps not one of the main public highlights of the season, but nonetheless a very poignant moment in the team's season. "Initial preparation was mostly paperwork with 'safety cases' put together in conjunction with the Reds to be approved by the RAF. Those conversations started at the beginning of the year. The flying element was then pre-briefed with Red1 and Red10 in meticulous detail in the weeks before the flypast". The flypast at Waddington was one of the highlights of the season for many present and whilst the more private nature of the RIAT flypast prevented it from gaining quite the same status, both are key moments in the team's history. "The two flypasts were unique and challenging in their own way. The first one at Waddington almost ended up not happening due to Air Traffic Control restrictions keeping us on the ground so long that we almost didn't make the rendezvous in the sky! The two Gnats were formating on a Hunter which in turn formated on the Reds, whereas at RIAT I was flying the lead Gnat and formating directly on the Reds, which was incredibly nerve-wracking - any mistakes there and it could have been very embarrassing! These flypasts were a childhood dream come true, so without doubt a high point in the Gnat Display Team's history." It is not only the Red Arrows that the team have been seen flying with through the season, having also performed alongside the Vulcan at both Dunsfold and Duxford. These were a result of an existing relationship between the team and Vulcan chief pilot Martin Withers. 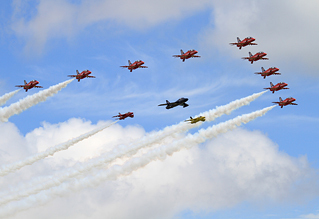 The formations were further made possible with the experience gained formating with the Red Arrows earlier in the season, providing evidence of the team pilots' mixed-type formation flying credentials. After initial discussions at Farnborough, the search began for an airshow where both the Vulcan and Gnats would be in attendance, and whose organisers would be happy to accommodate the formation flypast. In the end there were just two opportunities, with the full three-ship escorting the Vulcan at Dunsfold and just a pair at Duxford. Similarly with the Red Arrows flypasts, all of the preparation for these memorable 'airshow moments' was done beforehand, either via telephone briefings or on the ground, with no prior rehearsal of the formations. At Dunsfold, there was however an opportunity to spend a few minutes before the run-in over the airfield ensuring the formation was correct and to adjust to the challenges of flying in formation with such a large aircraft. The size of the Vulcan's delta wings could have resulted in increased turbulence for Kev Whyman and Mark Fitzgerald formating on either wing, however, this was not as much of an issue as predicted. The larger turning circle of the Vulcan was a good example of the differing characteristics that had to be overcome though, and for which those few minutes before the flypast were crucial, not only for Kev and Mark on the wings but also Chris Heames leading the formation ahead of XH558. As with many things, experience is key and the flypast at Dunsfold helped to ease the process at Duxford, with two Gnats taking up positions on the wings of the Vulcan. Both of these formations offered great contrast in aircraft type, particularly in size, helping to aid their popularity with the gathered crowds and are something that the team are looking to replicate in future, not only with the Vulcan but with other types as well. The evolution of the team continues too, with a rare single-seat fighter variant of the Gnat arriving at North Weald's Hangar 4a earlier this summer. Twenty-five F1s were built by Folland for the Indian Air Force (IAF), with the company supplying a further twenty kits to the Hindustan Aircraft Limited. The aircraft proved popular in India with HAL going onto build a further 195 themselves. The Gnat proved itself a more than capable platform to fight the Pakistani F-86s (and their MiG-19s) in the Indo-Pakistan War, and it's popularity with Indian Air Force pilots earned the F1 nickname 'Sabre Slayer'. Despite its successes though, it was not without its faults and the Indian Air Force issued a requirement for a newer version in 1972. This led to the development of the Ajeet by HAL - not unlike the Gnat on initial inspection, but improved in many areas. The example acquired by the Gnat Display Team is IE296, which upon disposal by the Indian Air Force was purchased by David Tallichet for his Chino-based Military Aircraft Restoration Company. After years stored in a dismantled condition, IE296 was acquired by George Pérez when Tallichet began downsizing his collection. Under Pérez's ownership the jet was partially restored and was repainted into an IAF livery, however the restoration was never completed. In early 2014 the aircraft began its journey to North Weld from Washington, having been acquired after a period of lengthy negotiations. The current plan is to register the F1 as G-SLYR - a reference to the 'Sabre Slayer' nickname. This rare and exciting addition to the team could be in the air soon, as Kev tells us "the aspiration is to have the F1 in the sky for 2015 and a four-ship as soon as possible after that". The team's decision to operate their jets in different colour schemes is notable, and one that adds to their character - "I think this it is very important as it serves as a real-time pictorial history of the jet, however the colour scheme for the F1 is at this point a closely guarded secret". With a great variety of Gnats already in the fleet and the single-seater soon to follow, we wondered if there is anything else that needs to be added to the team for Kev to get his 'dream Gnat'... "I think we have covered the key aspects of the Gnat T1 history with our current three-ship, therefore the 'Kev Whyman dream Gnat' would actually be the diamond four-ship!" 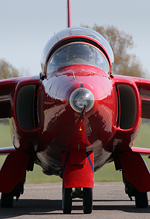 The increasing importance of the internet makes it is easier than ever for any business to get direct feedback from its customers, and the Gnat team are well aware that forums like UKAR offer a terrific window into the airshow going public's opinions. "We read the UKAR and other social media forums and pay close attention to them and our image in the public domain. The one message I would like to give the enthusiasts? If you like what we are doing, shout about it, tell everyone and lobby your local airshow organiser to make sure we feature in their flying programme. That is the best form of support they can give!" On Saturday 25th October, from 11am, the team will be holding an open day at their North Weald base. The open day provides the perfect end to a year Kev described as "ground-breaking and momentous" for the team, marking the great success they have had whilst also allowing great access to the aircraft and the people that keep them alive. Throughout the day the three Gnat T1s will be available for inspection and the plan is for them to launch and perform a flypast. Unfortunately airspace restrictions will rule out a full display, but visitors will be able to see the current state of the F1 restoration project and the team pilots will also be on hand to speak to supporters. 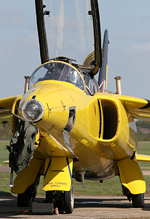 Whilst there is no fixed cost for the open day, the team have requested that anyone taking advantage of the opportunity makes a donation to the Heritage Aircraft Trust, the charity set up to preserve vintage UK aircraft that supports the Gnat Display Team, with proceeds going towards supporting the team's considerable operating costs. Whilst planning for next season is still at an early stage, the team having already been booked for a number of events in 2015, of which more details will be released on their website in due course. It is good to see that the team's work to provide the display circuit with such a unique team is being rewarded. UK Airshow Review would like to thank Kev Whyman and Samantha Waller for taking the time to give us this insight into the team.